This new series looks very interesting so make sure to bookmark this spot and come back from 9 PM – 10 PM ET! for our Bull recap! While you wait for our recap make sure to check out all our Bull recaps, news, spoilers & more! A wealthy man is in his living room drinking and listening to music. He falls asleep. An intruder comes in and shoots him. The next day, his wife is a suspect. She is angry that they want to walk her out of her house in handcuffs. She is a Lexington, she tells her lawyer. The next day her lawyer meets with Bull. Bull knows all about Rebecca Lexington. Her lawyer tells Bull she has a solid alibi. He tells Bull her husband was killed by one single bullet to the head, a kill shot. Bull arrives back at the office. No one on the team is happy that they are going to defend Rebecca. Danny points out that the intruder entered into the main door and only the husband’s belongings were taken. It looks staged. A writer, Kendall Tyler, who wrote a Lexington biography, arrives at the office. She is looking for Bull. She has some information that could exonerate Rebecca. But she has some conditions. Kendall wants access to everything Team Bull will be dealing with. 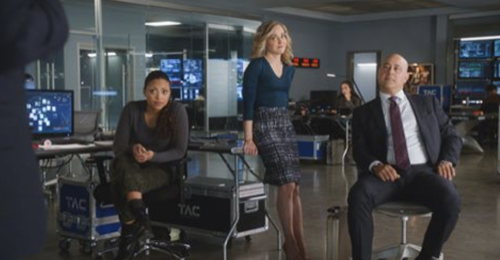 Bull and Rebecca’s lawyer go over the kind of jury pool they are looking for, a juror who believes in a simple explanation and isn’t going to buy into the tabloid stories surrounding this wealthy family. They are looking for a juror who is straightforward, crisp and clean. They find their four. Rebecca tells Bull she is happy he is on her team. She asks if he could meet her daughter. Bull agrees. Before he leaves the courtroom, he sees Kendall the writer. She reminds him that he needs her. She also tells him to ask where the oil is. What a weird thing to say, Bull thinks. At Rebecca’s house, Bull meets her daughter. He notices it is the maid’s night off and it is pretty cold in their home. He realizes the Lexington’s are broke. Bull confronts the lawyer, who is quick to tell Bull he will be paid. Bull just wants the whole story of what is going on. Bull and the team held a mock trial the next morning with the Lexington’s. Benny pokes holes in Rebecca’s daughter’s alibi. The mother and daughter were not out to dinner during the time of her husband’s death. She tells Bull she has to come clean. They retreat to his office to talk. She explains that the marriage had run its course now that their daughter went to college. Her husband also had a serious gambling problem. If they didn’t own their house outright they would have no place to live. The well is dry.